Google AdWords is a powerful online marketing tool that can benefit any type of business. In short, it is a pay-per-click (PPC) advertising service that allows you to run search or display ads for your business. Search ads will display on Google’s search engine alongside organic search results (Google’s Search Network), and display ads are shown in Google’s Display Network – over 2 million websites that can reach 90% of internet users (Google). Google AdWords has become a popular online marketing tool because it has the ability to reach users that are already interested in your product or service. Unlike traditional media, it is extremely flexible and provides valuable data to easily measure which campaigns are attributing to conversions and which ones are not. Additionally, it can prove to have faster results than implementing SEO. While we feel both SEO and PPC are equally important, PPC does not take months to see benefits from your efforts as does SEO. Unfortunately, setting up AdWords campaigns isn’t always the easiest process; it requires knowledge and understanding of the platform to ensure campaigns are set up correctly. As a Milwaukee-based marketing agency, we constantly conduct audits and edit clients’ existing campaigns, and see a large variety of mistakes. 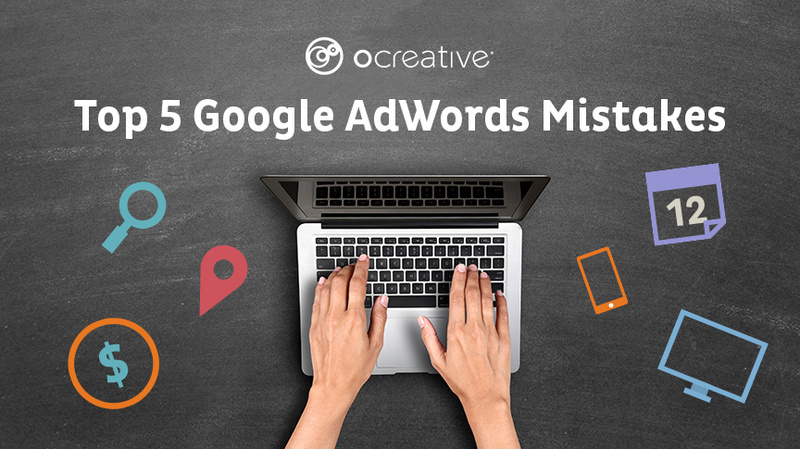 In this article, we outline the top 5 common AdWords mistakes to avoid and therefore ensure your campaigns run smoothly and benefit your business in all ways possible. One of the most beneficial aspects of advertising on the Google AdWords platform is the ability to set your own budget. Every month, Google will stop showing your ads if you have maximized your budget to ensure you do not go over. However, this can hurt your results if you do not sufficiently allocate the right budget based on your average cost-per-click (CPC). The average CPC is the average amount you spend when someone clicks on your ads. This is determined by your bid amount, quality score and ad relevance. If your daily budget is $5, but your average CPC is $2.50, you only have room in your budget for 2 clicks a day. We recommend you set an initial budget and as time goes on, analyze your CPC and adjust your budget accordingly. Broad: ads may show on searches that include relevant variations of that keyword. Misspellings, synonyms, and other related searches are included. Broad Match Modifier: similar to broad except synonyms are not included. Phrase: ads will show on searches that match the phrase inputted. Can include additional words before and after. Exact: ads will show that match the exact term or very close variations. Using the proper keyword matches will help target your ads to the correct people. The default keyword match that gets put in place is broad match, which allows for a large amount of variations on keywords for your ads to appear, and can lead to unwanted clicks. We always recommend starting with the phrase match keyword type to ensure you are targeting the right people. Choosing negative keywords along with your chosen keywords is one of the most important steps in setting up an AdWords campaign. Negative keywords are the ones where you don’t want your ad to appear in the search results. This helps with getting your ads to the right people and reducing the amount of unwanted clicks. The Search Terms feature allows you to see the exact keywords that were used when your ad was shown, along with corresponding data. This is a great tool to see if your keywords are the terms people are using, and if there are some off terms that may need to be added as negative keywords. Also, it can provide some additional insight on keywords to add or even new campaigns to create. Don’t be lazy setting these up either; put the same thought in as you would with your ad copy. Their power can be underestimated and don’t forget to analyze the data associated with them. Ad extensions can greatly assist in gaining conversions and aid in developing a highly successful PPC campaign. AdWords is not a “set it and forget it” platform, it requires ongoing monitoring. Budget adjustments, adding/removing keywords and ad copy changes are just a few of the adjustments that need to be made on an ongoing basis. Without ongoing monitoring, you could be spending money on unwanted clicks, targeting the wrong audience, or missing out on additional opportunities to improve performance. A landing page that coincides with your ad copy will increase the quality score of your ad, leading to a better ranking position and a lower CPC. It is recommended that your AdWords campaign is structured around your website to ensure each of your landing pages are relevant to your ad. If there is an aspect of your business that you specifically want to advertise, but are using your homepage as the landing page, it is necessary to create a landing page specifically for that part of your business to complement that ad. constantly monitor your data on a weekly basis, making necessary adjustments to improve your results. Because of its complexity, we recommend investing time to fully learn the AdWords platform or hire a Google certified agency. If interested in hiring an outside agency, contact us. Ocreative is a Google certified marketing agency that sets up and monitors AdWords campaigns for our clients on a daily basis.